As one of Canada’s oldest moving companies, King’s Transfer Van Lines is still owned and managed by the O’Donnell family. For over 90 years, we have been providing individual families and Canadian businesses with high quality moving and storage services. Perhaps this why 100% of our customers tell us that they will recommend our services to friends and family. 1922 After returning from Europe at the end of WWI, William purchases carriages and horses and opens “King’s Transfer Cartage”. 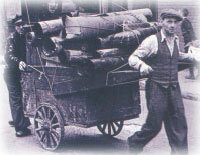 The early business focuses on the transportation of hay, snow and dry goods. 1935 The company takes a king-sized step forward with the acquisition of a motorized 1929 Ford Truck which is modified for commercial relocation. 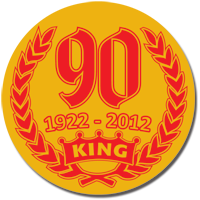 1940 King’s Transfer continues to grow, although many employees go overseas and never return. 1950 Twenty-three year old Gerald (Gerry) O’Donnell drives his first truck and establishes valuable contacts that leads to King’s Transfers’ rapid growth in the Montreal commercial relocation sector. 1960 Gerald O’Donnell takes over the operation of the company from his father and quickly becomes Montreal’s largest commerical mover. 1961 Gerald O’Donnell patents the logo KING OF THE MOVERS. 1962 Kings moves The Beatles’ equipment between Dorval Airport and the Montreal Forum. 1963 Along with seven other top movers, Gerald O’Donnell initiates Atlas Van Lines (Canada) and becomes one of the first Board of Directors. 1964 King’s moves many clients into Montreal’s newly opened Place Ville Marie. King’s relocates its head office from its original site on Duke Street to its current location on Eleanor St. (formerly St. Ann’s Kindergarten School). 1972 With business booming in the busy Highway 401 corridor, King’s opens a fully operational Toronto office and warehouse. 1978 William O’Donnell passes away, leaving the family business to Gerald and his two sons Charlie and William. 1990 Gerald O’Donnell passes away. His son William is appointed President, while other son Charlie takes over as Senior VP Operations. 1994 King’s wins its first ever ATLAS Canada NATIONAL QUALITY AWARD. 1997 King’s is recognized by Atlas Van Lines as their 1997 National Quality Award winner and then goes on to win National and/or Regional honours for the next 11 years (1998-2009). 1999 King’s goes world-wide with the opening of King’s Transfer International and its new state-of-the-art warehouse in LaSalle, Quebec. 2003 King’s opens King’s Transfer Calgary. 2005 King’s President & CEO, William O’Donnell, selected as Montreal’s IRISH MAN OF THE YEAR. 2006 King’s Transfer Van Lines is recognized by CJAD (Astral Media) as their longest running advertiser. 2007 King’s opens regional office in Winnipeg. 2009 20th anniversary of the Gerald O’Donnell Foundation Golf Tournament with a total of $400,000 raised over the years for local charities. 2012 Celebrating 90 years of serving Canadian families, and planning ahead for our 100th! 2013 King’s President & CEO, William O’Donnell, selected as Grand Marshal of the 191st edition of the Montreal Saint Patrick’s Day parade. 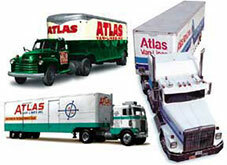 2014 50th anniversary with Atlas Van Lines Canada!